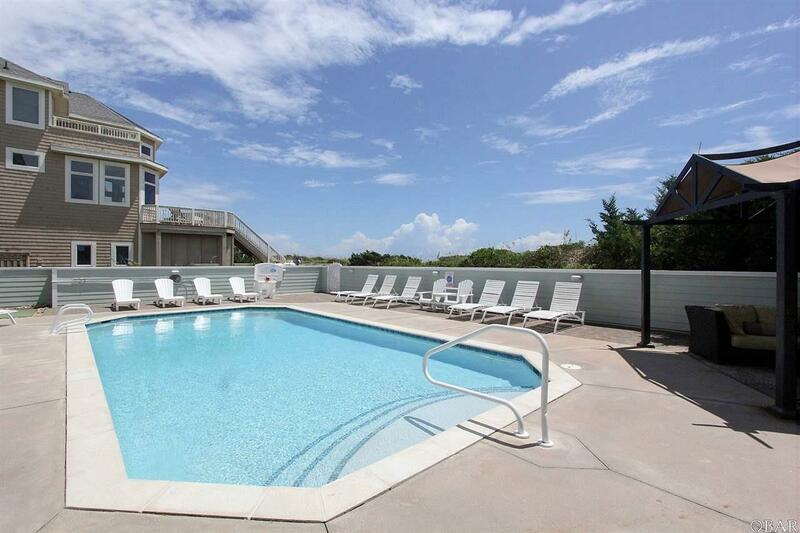 With a strong vacation rental history, oceanfront Splash Landing is a must-see! 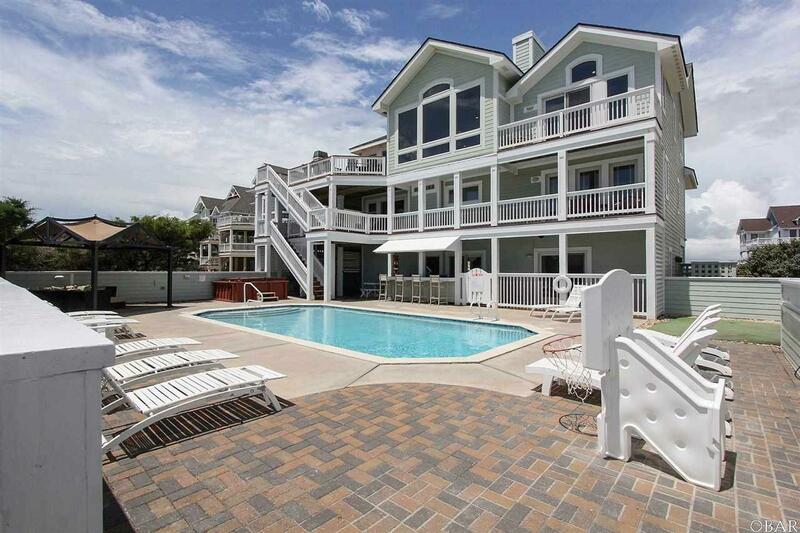 Located in the desirable Hatteras Landing Marina & Yacht Club, this home is just steps from the ocean, shopping and dining! The pool area is expansive and fully furnished with the best in amenities including a poolside tiki bar, 8 person hot tub, plush shaded cabana lounger, 12 lounge chairs, putting green and gas grill. The large concrete, in-ground pool features pool heat and measures 18'x35'. Ample furnished decking makes it easy to experience the gorgeous ocean views and relaxing sea breeze. The oceanfront top deck has been completely rebuilt with hidden fasteners. Starting at the top floor, you will find a king master suite with vaulted ceilings, oceanfront views, deck access and a spacious bathroom with granite vanity and large jacuzzi tub. The wall to wall ocean views from the great room will take your breath away! Elegant d'cor and lavish furnishings welcome you to the open living area that features a gas fireplace, LED TV home theater system with surround sound and a nearby half bathroom. The gas fireplace is surrounded by a custom wall designed with sand and shells from the beach. The gourmet kitchen features granite countertops, 5-burner island gas on glass cook top, 2 dishwashers, dual ovens, and ice machine and pantry. Meals become memories in the oceanfront dining area or the adjacent breakfast nook. 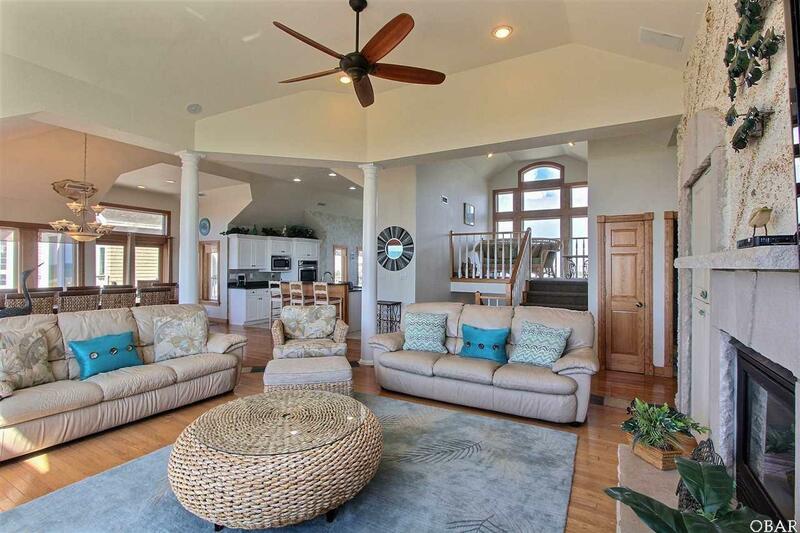 The top level loft provides peace and solitude with stunning ocean to sound views. 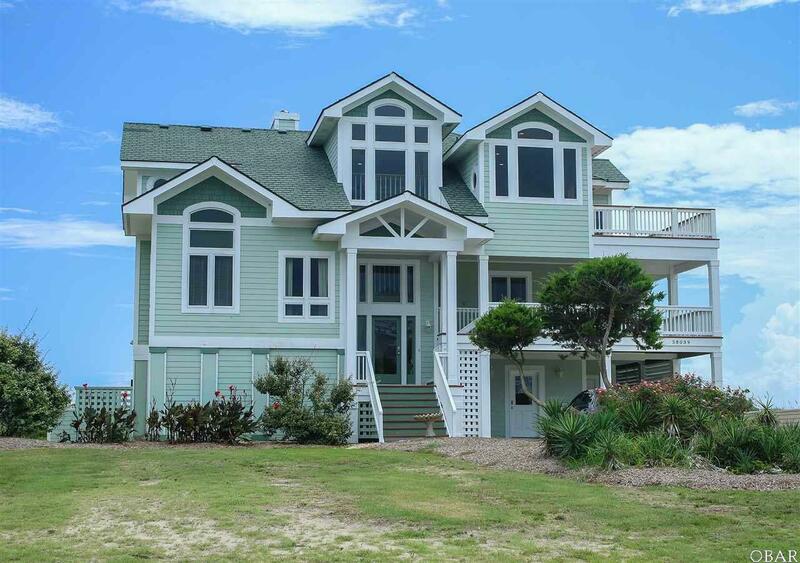 The second floor offers 3 more master bedrooms (2 kings, 1 queen) each with private baths, ocean views and deck access. The bonus area on this floor provides a daybed with trundle. There is also a work area with printer/fax/copy machine, large library and a game top table. Also on this level is the custom theater room with comfortable, fully reclining leather seating and projection screen. The game room features 7' pool table and foosball, complete with a kitchenette, refrigerator, microwave, ice machine and custom made surfboard bar. This level also features a media room with comfortable furnishings, sofa bed and HDTV with surround sound. The half bath is nearby for convenience. This level also has a master bunk bedroom and king master bedroom as well as a large laundry room with 2 full size washers and dryers. When you drive up to Splash Landing, entering is a breeze as the first floor is located on a concrete slab with covered entry and carport. Owner is a licensed NC General Contractor and has completely rebuilt the home since purchase, with the best in upgrades and the highest code standards. 2018 upgrades include: wainscoting added to game room, new deck rails and privacy boards, exterior paint and total replacement of north side lap siding, as well as luxury vinyl plank flooring in the bottom floor and ceiling fans in the great room. Brand new appliances added within the last 5 years: both washers and dryers, double oven, ice machines, kitchen appliances and game room refrigerator. Light dimmers added to many rooms as well as upgraded LED lighting and solid bamboo flooring on the mid level and top floor master bedroom. NEW Great Room Furniture just added! Seller is licensed North Carolina Real Estate Broker. Listing agent is relative of seller. Listing courtesy of Jessica Perry of Dolphin Realty, Inc..